Manjula is the founder of the website Who Pays Writers?, an invaluable service dedicated to helping freelance writers anonymously share current publication rates and their experiences getting paid. As managing editor of Zoetrope: All-Story magazine, a title that has won every major story award including the National Magazine Award for Fiction, Ms. Martin sees to the quarterly publication of a stable of prominent contemporary writers and artists. In her first book, Scratch: Writers, Money, and the Art of Making a Living, the editor has collected interviews and “…essays from today’s most acclaimed authors–from Cheryl Strayed to Roxane Gay to Jennifer Weiner, Alexander Chee, Nick Hornby, and Jonathan Franzen…” on the intersection of writing and commerce. Her writing has also appeared in the Virginia Quarterly Review, Pacific Standard, Aeon Magazine, Hazlitt Magazine, The Awl, SF Weekly, The Rumpus, and many others. Kelton Reid: Welcome back to The Writer Files, I am your host Kelton Reid, here to take you on yet another tour of the habits, habitats, and brains of renowned writers. In part two of this file, the writer and managing editor of Francis Ford Coppola’s award-winning magazine Zoetrope: All-Story, Manjula Martin, returns to talk about the realities of making a living in the writing world. Manjula is the founder of the website Who Pays Writers, an invaluable service dedicated helping freelance writers anonymously share current publication rates and their experiences getting paid. As managing editor of Zoetrope, a title that has won every major story award including the National Magazine Award for fiction, Ms. Martin sees to the quarterly publication of a stable of prominent contemporary writers and artists. In her first book, Scratch: Writers, Money, and the Art of Making a Living, the editor has collected interviews and essays from today’s most acclaimed authors from Cheryl Strayed to Roxane Gay, Jennifer Weiner, Alexander Chi, Nick Hornby, Jonathan Franzen and many others, on the intersection of writing and commerce. The New Republic said of the writer, “Manjula has done more than perhaps anyone else to shed light on the financial nitty gritty of the writing profession.” Her writing has appeared in the Virginia Quarterly Review, Pacific Standard, Aeon magazine, Hazlet, the Awl, SF Weekly, the Rumpus, and many others. In part two of this file, Manjula and I discuss productivity, irregular hours and the 400 hats of a working editor and writer, why finding your writing flow is so important when you have a day job, one great hack for beating writer’s block, how creativity resists definition and why writers need to share info about making a living. If you’re a fan of The Writer Files, please click subscribe to automatically see new interviews as soon as they’re published. If you missed the first half of this show, you can find it in the archives on iTunes, on WriterFiles.FM, and in the show notes. Kelton Reid: I’d love to dig into your productivity. You wear a lot of hats, clearly, with all of the different projects you’re doing and do on a daily basis for your day job. Let’s talk about what does your day usually look like? How much time are you doing research? How much time are you actually sitting and clacking away? Manjula Martin: Yeah. I work 40 to 60 hours a week at my job. It varies depending on where we are in the production cycle. My day is busy. I am reading and researching in some form or another most of the day. In terms of whether I’m reading or researching for my own writing work, it’s a much smaller amount of the day. I read for pleasure, usually at night before bed. I’ll tell you right now I am sitting in my gym clothes because I just came from the gym. I’m in my living room because I am working from home today. I got up this morning at 7:00 and I sent a bunch of emails and corresponded with my layout designer and my co-editor and then also did a bunch of emails for the promotion of the Scratch book, and then I ran to the gym and worked out and then I ran home and ate some toast and got on the phone with you. I’m not sitting here writing beautiful prose all morning on my typewriter. I do a lot of email, and for me productivity, it’s all about figuring out a way to just find time to carve out that space to do my own writing. One thing I think that I have learned is that unfortunately, at this moment in my career, there isn’t a regular schedule to that. Because I work for a publication, the busyness of it ebbs and flows, we’re quarterly. There’s one month where things are ****ing crazy, we’re in production, and then right after we publish the magazine it’s a little bit mellower and I’m doing more dealing with circulation, and that sort of thing. I should add here that the entire staff of Zoetrope is two people. Manjula Martin: We manage circulation and marketing and everything. I think it’s identifying that ebb and flow in a larger sense in my life, not talking about the ebb and flow of the day, but talking about the ebb and flow of weeks or months or even seasons, and just being okay with that knowing that like, “Right now things are crazy and I’m promoting this book and I’m also going into production on the magazine on Monday. So it’s going to be really crazy and I’m not going to write anything for probably two weeks.” Then I’m going to have some time off and then I’m going to write all day for three days. Manjula Martin: I also happen to work better in long chunks. That’s actually somewhat conducive to the way that I write. Kelton Reid: That’s cool. Like a lot of writers who have day jobs, we kind of push our other projects to the margins, but finding that flow is so important, isn’t it? To find those longer deep flow days where you can just get into it. Manjula Martin: Yeah, and I think a lot of that psychologically has to do with being okay with the reality of your life. I would love to wake up every morning and write for three hours, but I don’t, because I’m exhausted and I need to sleep, and exercise is important to me and it keeps me from being depressed, so I need exercise. That’s what I do in the morning. Once I understood that, “Okay, this is how it’s going to go,” accepting that and not being too hard on myself for it, I think, is a huge part of that. You have to look at what actually your life and your work is like and not try and force yourself into habits or productivity hacks or anything like that that aren’t realistic and that aren’t actually applicable to your own situation. Kelton Reid: Totally. How do you feel about writer’s block? Manjula Martin: I didn’t believe in it until it happened to me. Writer’s block hasn’t been a big problem in my life, I think it can be a really big problem for people and I recognize that it is a huge psychological block for a lot of people. I have never had that feeling of staring at the blank page and being like, “Ugh, what do I put on it?” For me I just am like, “I wish I could have time to have a blank page,” is sort of how I feel sometimes. For me, it’s a lot about being busy and having 400 jobs. I do think that I have, I think, since November 8, 2016, had difficulty writing. The way that I found to work around it is to write, but maybe write other things. Kelton Reid: Yeah, something that Austin Kleon actually calls ‘productive procrastination.’ He also contributes … You interviewed Kleon for your book. Manjula Martin: Yeah, do something else. The cool thing about being a writer is that “working” can mean reading a book or even maybe staring at the wall and thinking. There is a lot of process and internal stuff that goes into creating literature. That’s all part of the job. It’s important to give yourself time to do that stuff. It’s also important to know the difference between processing and procrastinating. Yeah, I think for me, for example, since the election I’ve had trouble working on my novel, because I’m sort of like, “How is this ****ing relevant? I don’t know.” I’m rethinking parts of it. I have found that I am writing letters, I’ve been writing letters to friends on paper with a pen, and it’s been amazing. It’s basically like a much easier way to write in your journal. Kelton Reid: Yeah, for sure. And you work through stuff as you’re doing it, don’t you? Manjula Martin: You don’t even have to send them! You can just write them. Kelton Reid: You never do. That’s right, that’s a great trick. I think an author I had on recently, Dan Buettner, he’s a journalist, said that very thing. He said, “When you get stuck you just write an email to someone,” and often times he doesn’t send it because he’s working the problem out in his head as he does it. Manjula Martin: The fourth grade method, man. Kelton Reid: Fourth grade method, noted down. Get up on your desk. Let’s ask a couple workflow questions, these are easy ones. Mac or PC? Kelton Reid: Are you using Microsoft Word primarily or Scrivener or something crazy? Manjula Martin: I use Microsoft Word because I’m old. But, I should say I have recently started writing longhand and then typing it in at the end of the day. Kelton Reid: Okay, I like that. Manjula Martin: Which is a tip I picked up from Alexander Chee. Kelton Reid: Yes, and also appears in your collection, is that correct? Manjula Martin: It depends. Yeah, I was going to say my number one procrastination tool is get off the damn internet, which includes your phone, hot tip. If you turn off your computer you also have to turn off your phone. Manjula Martin: People joke a lot about Jonathan Franzen‘s opinions on the internet, which he goes into in the book a bit, he’s in the book too. I gotta say I’m with him on this one, turn it off. Kelton Reid: Yeah. Again, that prosthetic brain is easy to use, and then I think your real brain just atrophies a little. Kelton Reid: It loves it. Manjula Martin: For me … It loves it, but then it can’t come back from that, I feel like. For me, if I get up and I turn on Twitter first in the morning, there’s no coming back from that. My whole day is different. Kelton Reid: Yeah. All right, well I want to get into creativity before I lose you here. Can you define creativity? You rub up against all these amazing creatives in all these different fields. Do you have a definition of creativity floating around? Manjula Martin: Probably not. Creativity tends to resist definition and I would say that’s sort of its thing. Kelton Reid: Yeah. When do you personally feel most creative? Manjula Martin: When it’s foggy outside and I’m inside and it’s the morning and I have time. Kelton Reid: Yeah, time. Do you have a creative muse right now? Manjula Martin: Like a being? Kelton Reid: No, yeah, sure, it could be a deity, it could be other … TV show, I don’t know. Manjula Martin: One thing that I often turn to is poetry, I read poetry. I don’t write poetry, but I read it. At the moment I’ve been rereading Anne Carson’s Sappho fragments. The book is called If Not, Winter. Loving those. Poetry, I think for me, serves as a bit of a muse, but it’s also more of a writing prompt. It helps get things flowing. Kelton Reid: Yeah. It does require a different part of your brain to probably both write and read, I think. Kelton Reid: Which is so great about poetry. What, in your estimation, makes a writer great? Kelton Reid: Yes. The words, once again. Manjula Martin: Is this a trick question? Manjula Martin: Yeah, man, I’ll just leave it at that. Kelton Reid: Okay, perfect. I like it. That’s the most succinct answer I’ve had to date. Before we go, I know that you are in a bit of a time crunch, but what do you think … I’ll ask you one final fun one. If you could choose any author from any era for an all expense paid dinner to your favorite spot in the world, where would you go and who would you go with? Manjula Martin: Okay, let’s see, I’m going to start with … I would love to see what would happen if I took Gertrude Stein to Chez Panisse. Kelton Reid: Hmmm. And what would you eat? Manjula Martin: Whatever Gertrude told me to eat. Kelton Reid: Okay, perfect. All right, as we wrap up here, before I ask you to offer advice to your fellow scribes, I want to point back to this fantastic book, Scratch: Writers, Money, and the Art of Making a Living. It’s a fantastic book. It is a collection of essays, interviews, by writers at all different places in their careers. It’s broken up into three distinct sections: ‘Early days,’ we talk about the earlier parts of the career, ‘The daily grind,’ that every day grind, and then ‘Someday,’ which has some more successful authors talking about the perception, at least, of success. It’s a great book, kudos on this collection. Your contribution to it also very inspiring, lots of inspiring and somewhat heartbreaking things in there. Yeah, I want to point writers to that and readers alike, it’s a great one. Congrats. Kelton Reid: To wrap up here, in addition to Scratch, what other advice can you offer your fellow writers to keep going, keep the ink moving, keep the cursor moving and the ink flowing? Manjula Martin: A couple things, I guess. I would just say money and work are an intricate part of any art that an artist puts out into the world, whether or not you’re getting paid for that art, even. We all have to deal with money and we all are affected by it. So we need to share information and acknowledge that commerce is a part of literature. Whether or not you like it, it is. You don’t have to like it and you don’t have to be okay with it but you kind of have to do it. It might be a good idea to get educated about it and get comfy with it. My only other general advice tip for writers is to not listen too much to tips for writers. Manjula Martin: It’s useful and fun and we all love this, but make sure you’re spending more time writing than you are getting tips about writing. Kelton Reid: Yeah, I love that, that’s a great takeaway. Manjula Martin, thank you so much for taking time out of your schedule. Kelton Reid: Where can writers connect with you out there in the world? Manjula Martin: I’m on Twitter, for better or worse, it’s my full name, Manjula Martin. My other contact info is on my website, ManjulaMartin.com. I like getting new letters, so send me an email. Also, I have a newsletter, a tiny letter, it’s called 3 Cents, you can find that on my website as well. That goes out about once a month. Kelton Reid: Perfect. I will be signing up for that shortly. Thanks again, come back any time, we really appreciate your wisdom. Manjula Martin: Thanks for having me. Kelton Reid: Cheers. Thanks so much for joining me for this half of a tour through the writer’s process. 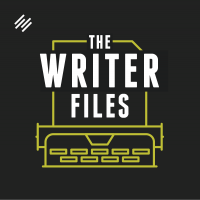 If you enjoy The Writer’s File podcast, please subscribe to the show and leave us a rating or a review on iTunes to help other writers find us. For more episodes or to just leave a comment or a question, you can drop by WriterFiles.FM and you can always chat with me on Twitter @KeltonReid. Cheers. Talk to you next week.